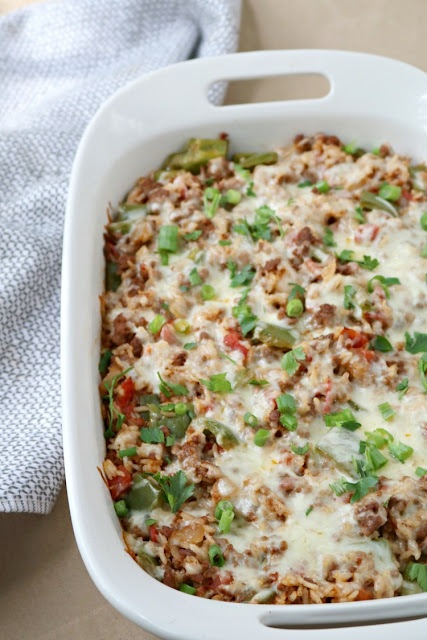 Stuffed Bell Pepper Casserole – this deconstructed stuffed pepper recipe is a cheap and easy dinner that won’t break the budget! One of my favorite comfort meals is stuffed peppers. Stuffed peppers are so versatile; you can fill them with nearly any flavor or combination of a meat and a starch. There’s usually too much bell pepper and not enough MEAT [pretty sure my meat lover is grinning as he reads this]. Not to mention, I always find making them to be a chore. That’s why I created this deconstructed version: Stuffed Bell Pepper Casserole. Prepare rice according to package directions. Do not overcook. Meanwhile, grease a 9x13 casserole dish with cooking spray. In a large non-stick pan over medium heat, sauté onion in olive oil until translucent. Add ground beef to skillet. Sauté until fully cooked and no red remains. Add bell pepper. Sauté until pepper start to soften (about 3 minutes). Stir in garlic, salt, pepper, tomato paste, diced tomatoes and Worcestershire sauce. Bring to a boil. Remove skillet from heat. Stir in cooked rice. Immediately pour mixture into prepared casserole dish.